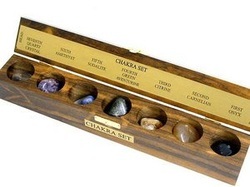 Contains 7 polished stones which relate to each chakra. The stones are Black Onyx, Carnelian, Citrine, Green Aquartz, Sodalite, Amethyst and rock crystal. This Chakra Healing Set includes 7 Tumbled Gemstones in a Wooden Display Box. 7 Tumbled Gemstones for each of the 7 Major Chakras.